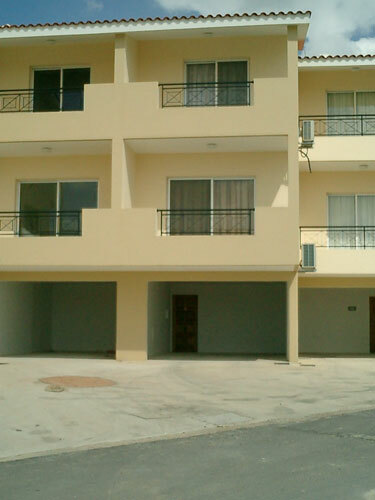 This 2 bedroom Town House which sleeps four persons, is set on 3 floors. The first floor provides under cover parking for two cars and a storage room. The first floor has a lovely lounge/dining room which includes a T.V.& D.V.D. This leads out onto the front Balcony looking over the Swimming pool and with views to the sea. The kitchen which is fully equiped including oven, hob, fridge, microwave and washing Machine leads onto the back balcony with view to the hills of Peyia. There is also a Toilet on this floor. On the next floor is the Two Bedrooms, one double bedroom which leads out to the balcony on the front (with Pool & sea views) and one twin bedded room which leads out to the Balcony on the back with view over the hills. The Apartment has fly screens throughout and is fully airconditioned (included in the rental price). There are two restaurants/tavernas within a few minutes walk and the centre of peyia is about a 10-15 minute walk, which has more tavernas as well as the Bank, supermarket and shops. The Apartment is about 15 minutes drive from the centre of Paphos, the market & the harbour, 25 minutes to the water park and about 30 minutes from Paphos Airport.